Jurassic and Cretaceous seas were filled with basal neopterygian and teleost fishes and neoselachian sharks that preyed on them (Chapter 7). A broad range of predatory reptiles also hunted fishes, ammonites, belemnites and other marine life. Pterosaurs and croco-dilians seized fishes near the surface (see pp. 224-9, 232-7), and mosasaurs (see p. 243) were important carnivores in the Late Cretaceous. Certain groups of birds also fed on marine fishes (Chapter 9),but the main reptilian predators were the ichthyosaurs and ple-siosaurs, both of which groups had appeared in the Triassic (see pp. 149-53). After early finds in the 1820s and 1830s, they came to be known collectively as 'sea dragons'. Plesiosaurs and ichthyosaurs were traditionally grouped as Euryapsida, a reptilian subclass that stood apart from the major terrestrial groups. Both ichthyosaurs and plesiosaurs are almost certainly modified diapsids, the ichthyosaurs falling low in the phylogeny, before the split of lepidosauromorphs and archosauromorphs, and the plesiosaurs lying on the lepidosauromorph branch (see p. 150 and Box 8.8). Both groups lost the lower temporal fenestra independently some time in their Permian ancestry. Sauropterygians (plesiosaurs, nothosaurs, placodonts) at least share some lepidosauromorph characters, such as a thyroid fenestra in the pelvis (Rieppel, 1993). The first true plesiosaurs are known from the Late Trias-sic and they are believed to be closely related to the nothosaurs. Plesiosaurs were generally larger, ranging typically from 2 to 14 m in total body length. 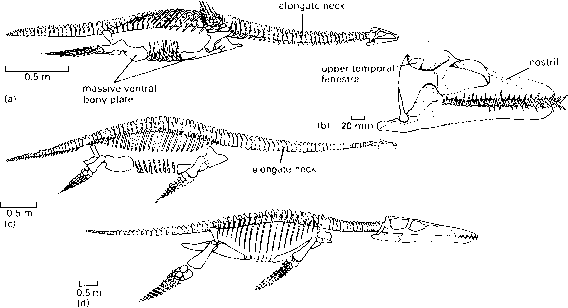 Plesiosaurs are divided into the long-necked plesiosauroids and the short-necked pliosauroids (O'Keefe, 2002). The plesiosauroids include four families. 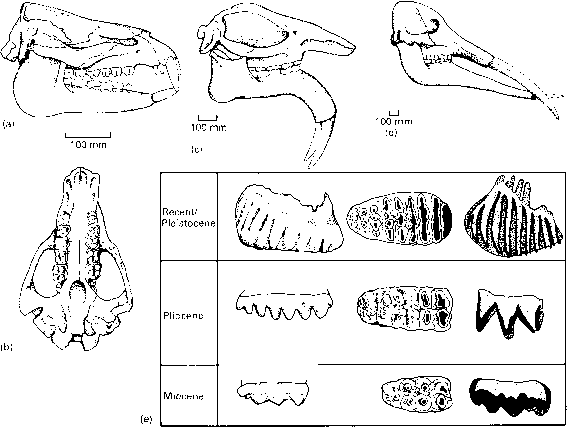 The cryp-toclidids from the Late Jurassic to the Late Cretaceous (Figure 8.35(a, b)) have long necks with 30 cervical vertebrae and a skull with a long snout, single (upper) temporal fenestrae, the euryapsid skull pattern and nostrils set back from the tip of the snout. The jaw joint is set below the level of the tooth row, which shifts the strongest biting point forwards. The long pointed conical teeth interlock when the jaws are shut, an adaptation to retain slippery fishes and molluscs in the mouth as the jaws close. The cimoliasaurids are a small group of Late Jurassic long-necked plesiosauroids, whereas the polycotylids are short-necked Late Cretaceous forms, long classified with the pliosauroids. The elas-mosaurids, such as Muraenosaurus from the Late Jurassic (Figure 8.35(c)), have very long necks and some Late Cretaceous forms boast as many as 76 cervical vertebrae. The pliosauroids include the Jurassic rhomaeleosaurids (Figure 2.8) and the pliosaurids, such as the Late Jurassic Liopleurodon (Figure 8.35(d)), up to 12 m long, and with a long heavy skull and a relatively short neck. Pliosauroids may have fed on smaller plesiosaurs and on ichthyosaurs. Pliosauroids had vast low-snouted heads, armed with powerful jaws and broad-based sharp teeth. The skull was designed like a lattice reinforced with girders to resist the great bending moments produced during biting (Taylor, 1992; see pp. 29-31), and the mandible was like a box girder for the same reasons, but at the same time it retained a streamlined shape to assist in fast swimming. The neck was shorter than in other plesiosaur groups, but pliosauroids nonetheless retained large numbers of cervical vertebrae. stroke creates a counterthrust that would slow the ple-siosaur down; the flying stroke is much more efficient, but the skeleton of plesiosaurs does not allow the paddles to be lifted above shoulder level. 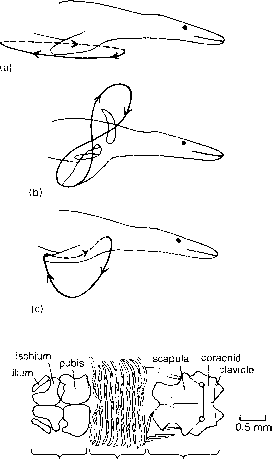 So, Godfrey (1984) proposed the crescentic path, which has the benefits of the figure-of-eight, but allows for the fact that the ple-siosaur pectoral and pelvic girdles are both flattened heavy units of bone that form an immovable ventral bony plate with the gastralia between the limb girdles (Figure 8.36(d)), and that the limb girdles are too weak for strong vertical movements. Ichthyosaurs arose in the Triassic (see pp. 152-3), diversified in the Early Jurassic and became much reduced in diversity in the Late Jurassic and Cretaceous, being represented then only by the Ophthalmosauria (Motani, 1999,2000; McGowan and Motani, 2003). There is considerable variation in size, with lengths of 1-16 m, but the dolphin-like body shape, long snout and large eyes remain common features throughout (Figure 8.37(a)). The body outline of ichthyosaurs (Figure 8.37(b)) is well known because of the exquisite preservation of specimens, especially in the Lower Jurassic of southern Germany where they may show in some cases a black 'ghost' of the skin outline. This shows that the paddles were extended by skin and connective tissue, that the tail fin was roughly symmetrical, even though the vertebral column bends down, and that there was a high dorsal fin made entirely from soft tissues. Stomach contents include tiny hooklets from the arms of cephalopods and fish scales, but seemingly no belemnites or ammonites possibly because their hard shells were spat out or shaken off. One Late Cretaceous ichthyosaur from Australia contains bones of a hatchling protostegid turtle and an enantiornithine bird (Kear et al., 2003), an eclectic dietary selection. trol roll and pitch, as in large cruising fishes such as tunas and sharks and in whales (Motani, 2002). Based on comparisons with living forms, Stenopterygius probably cruised at about 1.5ms-1 (or 5.4kmh-1) and it probably had an 'elevated ectothermic' physiology, like a tuna, in which control of body temperature is by external means, by high levels of exercise maintaining a blood temperature higher than the surrounding seawa-ter. Ichthyosaurs had the largest eyeballs of any known animal: the 9-m-long Temnodontosaurus had an eyeball some 300 mm in diameter (Motani et al., 1999). Such huge eyes must have been for detecting prey in conditions of very low light, at water depths of up to 600 m.
The weakness of the limb girdles of ichthyosaurs and their overall 'fishy' body shape suggest that they could not venture on to land. Marine turtles, penguins and probably plesiosaurs, which spend most of their time at sea, do creep out onto a beach to lay their eggs. Ichthyosaurs, however, bore live young underwater as dolphins and whales do, and they were born tail-first in order to avoid drowning: the head would emerge last and the juvenile could swim to the surface rapidly to take its first breath. Remarkable specimens from the Lower Jurassic of Germany and England show embryos within the ribcages of some specimens, usually one or two, but sometimes as many as 10 or 11 (Böttcher, 1990). Several specimens show the young apparently in the process of being born (Figure 8.38). The usual, romantic, interpretation of these specimens is that the mother sacrificed her life while giving birth. Much more likely in many cases is that the juveniles were expelled after the death of the mother by gases of putrefaction.